This one uses the Micro:bit and Raspberry Pi. The Micro:bit uses a serial connection to the Pi to send data. The credit for this goes to Martin O'Hanlon and David Whale. The Micro:bit sends messages to the Pi when the "a" button is pressed, which then interprets that instruction and randomly bounces the Minecraft character to a random height. 1. Having flashed your Micro:bit script and leaving your Micro:bit plugged into your Pi. 2. 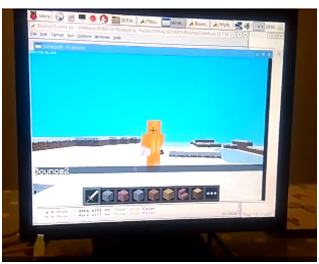 Open Minecraft, create a new world, ensure you can see the character like in the picture above, minimise the screen. 3. Run the Python code in 2.7 from above. 4. Press the A button on the Micro:bit, look at Minecraft and you should see the character jump up at a random height between 1 and 20!